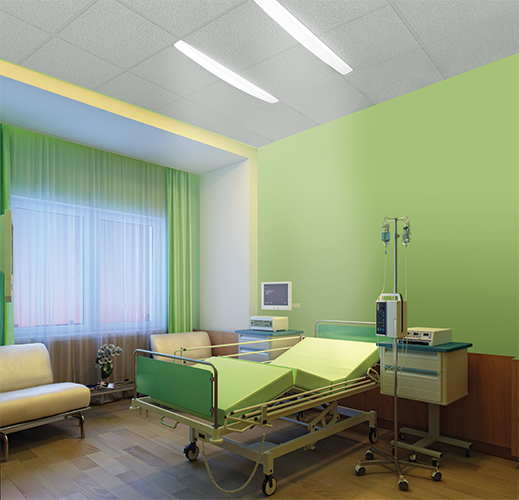 Ceiling and plenum space is precious in patient rooms. Besides ductwork and piping, specifiers must also work around bariatric lift supports, ceiling-mounted medical equipment, curtain tracks, safety mirrors, wall-mounted medical equipment, and nurse call systems and dome lights. Lighting needs to perform its functions without overcrowding that equipment. 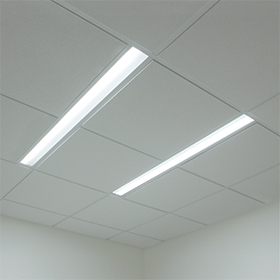 Luminaires in general have been trending toward slim linear forms for years, and the more general spaces in healthcare facilities have already incorporated those sleek designs. To meet contemporary aesthetics in medical spaces, specifiers have had to use non-medical solutions. Now, with the advancements of LED technology, Visa Lighting engineers are able to fit the necessary functions for patient room overbed lighting inside a narrow form. Their new dual slot luminaires, Unity and Lenga, are only 3” wide and 4” deep. These dimensions open up ceiling and plenum space—as well as answer current minimalist design needs. Product engineers also ensured each model has multiple mounting options to accommodate as many different ceiling grid types as possible, along with drywall options. This adds another layer of flexibility for specifiers. Both luminaires have their own unique design approaches. Lenga’s asymmetrically-angled coextruded lens is clearer on one side for exam levels and wider and more diffused on the other side for ambient light. When paired in tandem, the clearer side of each unit throws exam light asymmetrically onto the center of the patient bed. “Lenga is a great solution for ICU or ambulatory emergency care applications because it can provide a higher lumen output for exam lighting,” says Emery. The standard white model (see spec sheet here) emits 2700-2800 lumens in ambient mode and 8200-8600 lumens in exam mode. Unity, on the other hand, is an extension of an award-winning healthcare line that Visa Lighting introduced to the market in 2011. Every model appears soft and cloth-like, with curved diffusers that bring warmth and comfort. Their new dual slots retain that same curved softness from long, narrow bodies. “Standard patient care rooms would really benefit from the Unity slots,” says Emery. “They encourage a quiet, peaceful healing space.” The standard white model (see spec sheet here) emits 5300-5600 lumens in ambient mode and 7800-8200 lumens in exam mode. The tunable models of both families (see tunable model specs: Unity and Lenga) emit a CCT range of 2700K-5000K and also provide ambient and exam lumen levels. For Unity and Lenga, patient-centered design is all about doing your job without getting in the way—physically or visually.